I HAVE BEEN somewhat amused at a clipping sent me containing an article concerning myself in the "Catholic Herald", published in England, issue of September 1, 1967. Frequently clippings are sent me of hostile, slanderous, defaming attacks, falsely accusing, persecuting, and intending to mislead those who are hearing and reading God's TRUTH as we proclaim and publish it. All such attacks are ignored. I have never answered them. However, this short article in the "Catholic Herald" is different. I would not consider it either as slanderous or an attack. Obviously it was not intended to sing my praises. I think the reader might even detect a note of mild sarcasm, although, from the writer's point of view, obviously differing from mine, he may well have intended to write objectively. Actually, he freely admits that my prophecy in May of this year, (that war would break out between the Arabs and Israelis within about a month) really happened. He was absolutely correct in part of his headline, also, when he referred to the silence in broadcasting to Britain being only temporary! Only yesterday I received a long distance call from Paris confirming final arrangements to resume superpower broadcasting to cover the entire British Isles, beginning either December 1st or January 1st. However, the complete headline was: "Temporary silence for prophet of doom." Now I should like to correct the editor on that "prophet of doom" phrase. First, I do not claim to be a prophet at all. Second, I do not preach a message of DOOM, but diametrically the OPPOSITE — I proclaim the GOOD News of the peaceful, happy, prosperous, utopian WORLD TOMORROW! We do point out that mankind is doing its best to bring utter doom on itself. We DO make listeners aware of this world's deteriorating conditions — we do cry aloud and show the people their sins (Isa. 58:1). But we also make plain the CAUSES — and we proclaim in power that the living CHRIST whom I serve is very soon going to intervene in ALMIGHTY SUPERNATURAL POWER to SAVE mankind from itself, and bring us a joyous, glorious and prosperous PEACE! Our Gospel is a JOYFUL Gospel. It is a Gospel of HOPE — of INSPIRATION — of ASSURANCE for the future! Since I do not regard this as persecution or an attack — of which I receive many and do not choose to dignify by answering — I feel our readers might be interested — and profited — by reading what this particular article said — along with my comments. It begins: "With the pirate radio stations banned from the air, people in this country can no longer hear Herbert W. Armstrong's sword and thunder broadcasts..."
I break off at that point for comment. The ship radio stations which encircled the British Isles were dubbed by the press "pirate radio." But they were in no sense "pirates." A pirate ship is a marauder, a robber on the high seas. The owners of these ships did not come ashore and plunder, rob, steal. Their broadcasting was NOT ILLEGAL. They were not stealing anybody's wave length. There was no law against them — that is, as long as The WORLD TOMORROW was broadcast by them to many million eager British listeners. Actually, the ships themselves are not illegal even now — being outside British jurisdiction. What the British government did was to make it illegal for Britons or British institutions to broadcast over them. Ambassador College in England is incorporated as a British institution. As soon as such broadcasting did become illegal, we took the program off. We preach and practice submission to authority. The writer of the Catholic article speaks of "Herbert W. Armstrong's sword and thunder broadcasts." Now I do not consider that an insult at all. In fact that is rather complimentary, when you understand. You see, God Himself speaks of His Word, the Bible, as "the sword of the Spirit, which is the Word of God" (Eph. 6:17). All Christians are advised, in this passage, to take up THIS "sword," as part of the whole armour of God, to withstand in the evil day. This Word of God is pictured as a sharp sword coming out of the mouth of the soon-coming Christ — who is the "Personal" Word of God. The Bible is "sharper than a two-edged sword" — Hebrews 4:12. It corrects — and that cuts! And what about the voice of THUNDER? God Himself speaks with the voice of THUNDER: "After it a voice roareth: He THUNDERETH with the voice of His excellency; and He will not stay them when His voice is heard. God THUNDERETH marvellously with His voice; great things doeth He, which we cannot comprehend" (Job 37:4-5). God told Jonah (Jonah 1:2 "Moffatt" translation): "Go to Nineveh, that great city, and THUNDER in their ears that their wickedness is known to me..."
Continuing the article: "...denouncing evolution, socialism, 'counterfeit Christianity' and modern comfortable living." Well, we do point out some amusing and ridiculous fallacies of the evolutionary theory. Millions enjoy these talks and articles; thousands of students are opening their eyes; and a few dyed-in-the-wool victims and followers of the deception become angry because they cannot answer our proofs and are yet unwilling to give up their beloved fable. But "SOCIALISM"? We do not enter into politics. I was not aware that we attack socialism as a political "ism", although we have stated a few facts about communism, which is anti-God. And "modern comfortable living"? Oh NO! We're all FOR "modern comfortable living," as long as it is the RIGHT KIND of living. We like to see people "comfortable." We are not against any MODERN comforts that are GOOD for people. God denies us absolutely NOTHING that is GOOD for us — and for others. He denies us only that which is harmful to the doer or others. God is a God of LOVE — the God we serve and proclaim, that is. Perhaps the writer of the article meant certain modern practices that are harmful and injurious. Continuing the article: "Perhaps this silence is the 'famine of hearing the word of God' prophesied by American evangelist Mr. Armstrong 10 years ago." No, not at all. As the headline of the article stated, the "silence" over Britain is only TEMPORARY. And when the silence foretold in Amos 8:11 comes, it will be worldwide. But again — only TEMPORARY because it will immediately precede the coming of Christ. And when He comes, "...out of Zion shall go forth the law, and the word of the ETERNAL from Jerusalem" (Isaiah 2:3; Micah 4:2), and "...the earth shall be full of the knowledge of the ETERNAL, as the waters cover the sea" (Isa. 11:9). Back now to the article: "If that seems too far-fetched, there are other SHOCKING FACTS which Mr. Armstrong has been PROVEN to foretell (to use his own style of emphatic typesetting). In May he told an assembly of his disciples at a college in Hertfordshire that he expected war to break out between the Arabs and Israelis within the month." COMMENT: One could hardly call that a hostile or defaming statement, when everyone knows that the war DID break out in June — precisely five weeks, to the day, after the prediction. I thank the writer for his acknowledgment. He continues: "His followers are now preparing themselves for the most sensational forecast of all: World War III, culminating in Armageddon and the second coming of Christ by 1975." Where did he get that 1975 date? I do not set any date for the second coming of Christ. I do say emphatically that it is NEAR — but I do not know the date, or even the precise year. All I know is what ANYBODY may know if he can read and believe the Biblical prophecies. And they do not reveal the precise year. Some have tried to figure the year, from the prophecies. Some even had it figured out to occur in 1936, but their applications and figures were in error. There ARE signs and indications. All world events fulfilling prophecy should warn us that it is now NEAR — POSSIBLY by 1975 — PROBABLY before 15 or 20 more years — but Jesus said plainly "But of that day and hour knoweth no man, no, not the angels of heaven, but my Father only" (Mat. 24:36). "According to the predictions, in the next eight years the Anglo-Saxon nations will be demoralized by automation and welfare, and weakened by droughts and floods." I don't know where he gets the demoralization by automation and welfare. We ourselves make effective use of automation — large printing presses, large refrigerated trucks transporting food grown on our own agricultural-extension farms adjoining our Texas campus — more than 3,000 acres — and our own-grown hard wheat, by which we ourselves produce much of the food for our hundreds of college students — our considerable IBM equipment, including the very latest computer. We may have mentioned abuses in this world's welfare programs, but we are not opposed to the principle of welfare, rightly, honestly and wisely administered. We're all for it, and administer it. Of course, this writer might have misunderstood. I'm sure our readers know well that, as a philosophy and way of life, we proclaim GOD'S WAY — which is the way of LOVE. And love is an outgoing concern. It is the way of helping, serving, co-operating, not of competition, selfish and greedy TAKING. 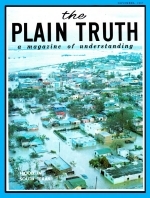 The droughts and floods are prophesied in the Bible. They most certainly already "have BEGUN to come to pass." Continue the article: "The 10-headed beast of the Apocalypse — which Mr. Armstrong sees as the European Common Market — will come under the control of a neo-Nazi soldier and a 'false prophet' who heads 'the great apostate paganized Church falsely calling herself Christian.'" Yes, he is pretty close to right here. Only I do not "see" the 10-headed "beast" as being the 6-headed Common Market — most certainly in its present form. The Common Market is preliminary to it — and the prophesied 10-headed "beast" foretold in this writer's Bible as well as mine may well be the outgrowth of it. But it will embody TEN nations or groups of nations, and it will be POLITICAL and military — not economic ONLY as the Common Market now is. And I do not say it will be under the control of a neo-Nazi soldier. I do not KNOW who the individual political leader will be, or even that he will be a German — though frankly the indications are he will be. He will not necessarily be a soldier. He continues: "Then 200 million Chinese and Russian Communist troops will sweep through Europe, leaving it 'TOTALLY devastated.'" If our readers would like to know what I do say — from the Biblical prophecies — on this, write for our free booklet "1975 in Prophesy." And we always point out, by the way, that the mention of the year 1975 in the title of the booklet does NOT mean we set that as the date of Christ's coming. The article continues: "The end of pirate radio, however, does not necessarily mean that we shall be cut off from hearing the message — so a cheerful 'World Tomorrow' official at the Hertfordshire college assured me this week. He said: 'If it is God's will that this witness go on in Britain, He will open up other means, other stations. Perhaps something from Europe. We're not pessimistic.'" That does not sound like a direct quote from one of our officials, but it is far more accurate than some "papers" have quoted, and undoubtedly accurate in substance. My answer: It must have been God's will! It has opened up! So again, things seem to work out as we say. Continue: "Mr. Armstrong made his first 'World Tomorrow' broadcast in Oregon 33 years ago. With a controlled panic style of speech — Mr. Armstrong had been trained in Advertising — he began to barrage western farmers." Well, now! — "controlled panic style of speech"! That's a real lalapalooza! I had to laugh at that one. As to how accurately it describes, I'll leave that to our listeners. I only know that both my son Garner Ted and I are in dead earnest about the Message God is sending into all the world by our voices — and there is no deceit, or affectation, in our manner of speech. We simply say what God gives us to say, straight from the shoulder, seeking to please no one but God. He continues: "He claims that he started on a shoestring, with 'a group of dedicated friends.' Now the broadcasts, most of them taped by his son, Garner Ted, are heard nearly every day on 303 commercial stations round the world. Mr. Armstrong states that the whole operation — including two training colleges in the U. S. and one here — cost £2½ million a year." I do not know where he got that £2½ million — for that is quite inaccurate — but it is true that this Work of God has become a worldwide Work. Then he concludes: "Where does the money come from? It is all donated, says Mr. Armstrong, by 35,000 'co-workers' who agree to give 10 percent of their income to the spread of his prophecies." At last he gets to the point that has always seemed to most disturb critics who write about this Work — "where does the money come from?" Most critics apparently have felt there must be something very wrong in any money being spent to proclaim and publish God's TRUTH. But I'm sure this writer can be neither jealous nor accusing in that regard, since the comparatively small amount of money it takes to operate this Work of God is infinitesimal compared to the TREMENDOUS riches and annual income of his Church — by far the wealthiest in the world. He was quite uninformed on that 35,000 (co-workers), by the way, but I assume he thought it was correct. I felt that our readers would enjoy reading a Catholic writer's appraisal of us. My comments are not intended to be a refutation, or "answer" to an accusation, but merely a correction of a few points and a further explanation I felt might be profitable for our readers. I do not consider his article derogatory, else I should not have dignified it with comment.